Steph Jordan Artist: PEACE, LOVE & SUSHI! A couple of times I noticed on my son's Facebook page that he mentioned he had been in a Sushi Coma. 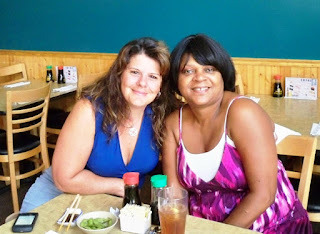 One of the many things we have in common is that we both love Sushi. He lives in New York so I'm sure he has access to some really yummy Sushi! Anyway..... I always laugh when I see that statement until.... today. Recently I've eaten more than my fair share of Sushi. Aside from the fact that I love it, it's just a super easy thing to do when cooking is just not an option. Who wants to turn the stove on when it's a million degrees outside. Today...I experienced Sushi Coma! I started feeling the nap about midway through lunch with my friend Kathryn from KVCreative Designs. 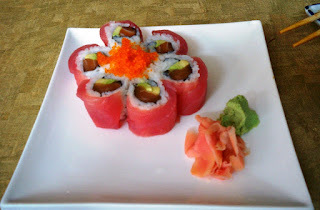 We feasted on a lunch of Spider Rolls, Shrimp Tempura Roll topped off with Salmon and a Cherry Blossom (pictured below). Can I just say OMG! Yummy! I wanted to mention the name of the place but the service was so awful I cant even recommend. The food was however, delicious. But it was one of those things were if the food wasn't so damn good the place would have gotten a full Thumbs down! The service was awful and the Waitress was in one of those "if you say the wrong thing I might cut you" kind of moods. Well that nap was unreal. I think I have to slow down on the Sushi LOL. Woke up in a fog. Forgot was I was planning on doing LOL. It's 11:30 something at night and I guess I'll create some Art now! Check it out. And please comment if you can. You know I love those comments. You may notice I have put a Fan Box on the SideBar to help Promote my Artwork. Please Join if you can. And also, please follow my Blog (or Join my Mail List) to stay updated on my latest Artwork, Articles and more.